-Salar de Uyuni lithium-containing salt lake is large but it is challenging to harvest and process. The lithium contained in the brine is likely to be processed into lithium carbonate. It is encouraging that Uyuni is finally to be exploited but its potential has been overstated in the world press given the state of knowledge we have of the resource. 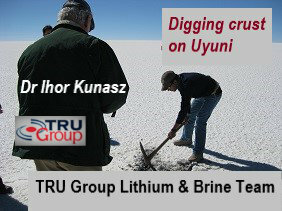 Lithium mining is difficult and the processing in the case of Uyuni the extraction of lithium from the brine will be particularly tricky. 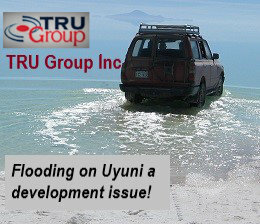 Since the TRU Group visit with client Mitsubishi Corporation in 2008 virtually no progress has been made - only a pilot plant has been constructed. A German Salt Consultant was hired and a so called process was developed as of 2017. As of November 2017 Bolivia COMIBOL is still evaluating bids from two main contenders for a minority stake - German and Chinese. Most western parties (investors) keen to see the resource developed have given up on the Bolivians and left town! It is our understanding that earlier in April 2016 that a Chinese group finally did some engineering & design - surprising since none of the China-based lithium brine-based-plants work very well. Some further strategic deep drilling exploration is required before we can accurately determine its realistic potential to produce lithium carbonate for batteries. 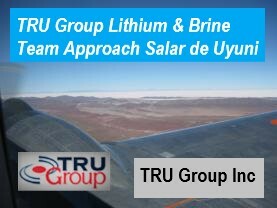 TRU Group Inc current estimates of practical sustainable lithium production from the resource has a wide range and production still most likely many years away! Dr Ihor Kunasz (pictured above at Salar Uyuni) has visited every reasonably sized commercially attractive salar salt lake in the world . .
Bolivia has been trying to build a US$900 million lithium project at Uyuni for a decade, but to date December 2018, it has only installed a pilot plant. This week it is reported: “Bolivia will be a relevant actor in the global lithium market within four or five years,” said Juan Carlos Montenegro, general manager of state-owned Yacimientos de Litio Bolivianos, or YLB. “And we don’t plan on stopping there.” The project is designed to produce 50,000 tpy of lithium carbonate, in addition to potassium chloride and magnesium chloride. Germany's K-Utec Technology is working on the plant's "final design". 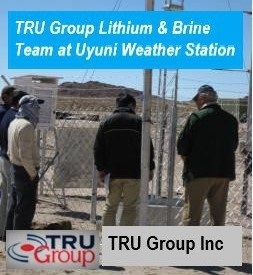 In TRU Group view, until competent people are put in charge and competent engineers are hired there will never be a successful Uyuni lithium extraction operation! Concepts for Uyuni Lithium Bolivia: Luis Alberto Echazú, Comibol, progress, Uyuni lithium plant, development of Uyuni Bolivia, project management, lithium expertise in Uyuni lithium project development.